If there is anything that is symbolic of the American Indian, it is the teepee. Yet, surprisingly enough, most Indian tribes didn’t use them. Teepees were actually only used by the Plains Indians, who were nomadic and needed an easily movable shelter. These tribes depended largely on the buffalo herds, so when the herds moved, they needed to pack up and follow. Teepees were actually in use before the coming of the horse, and they were initially much smaller. Because the Plains Indians used large dogs as their beasts of burden, they were limited to poles of 12 feet in length. By comparison, the poles for a teepee that was moved by horse were typically 18 feet long. The same poles that made the structure of the teepee were also used as the travois for moving it. Ideally, each family had its own teepee; but considering the number of materials and work it took to make one, it was not uncommon for young braves and even married couples to live with other family members until they could gather all the necessary materials to make their own. 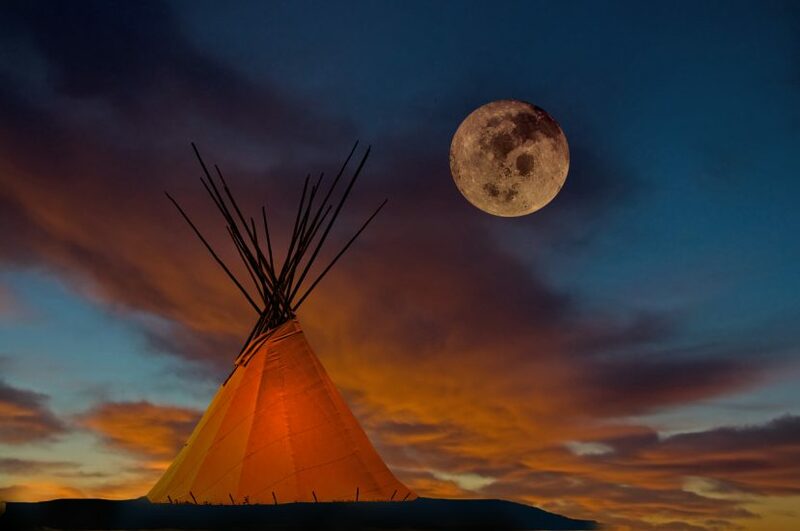 The teepee could sleep as many as 18 people, with their feet towards the fire and their heads away. Obviously, the hardest part of this would be gathering, tanning, and then sewing together the hides. While the Plains Indians killed buffalo all the time (it was the main part of their diet), they were not wasteful. They would try to use as much of the meat as possible, so it could take a considerable amount of time to get enough hides, prepare them, and sew them together. Gathering the poles usually required a trip to the mountains as there were very few trees in the Great Plains. Those that did exist weren’t of the type needed for erecting a teepee as they didn’t provide long, straight poles. Pines where needed for that, and they grew in the Rocky Mountains. The teepee is actually a very efficient structure as it sheds wind and rain quite well. A central fire kept the family warm, and the smoke rose to a smoke hole in the apex of the structure. Flaps on the covering could be adjusted by moving the poles attached to them to protect the smoke hole from the wind and rain. The basic structure of the teepee was based around three poles about 18 feet long. While any sort of poles could be used, the Lodgepole Pine was preferred as it was straight and had few branches on the lower part to cut off. These three poles were lashed together near the top and erected to form a triangle. The lashing was accomplished with one end of the rope and the rest was left unattached. This tripod was then pulled to an upright position with the rope, spreading the legs out to match the finished outline of the teepee. Another three poles were added in between those three, splitting the distance between them. As each was added, the rope was wrapped over it to bind it to the original three poles. Then, another six poles were added, once again splitting the difference between the existing poles. Each of these was also bound in place. With the structure erected, it was time to cover it. Early teepees were covered with buffalo hides that had been sewn together. After the slaughtering of the majority of the herds by the White Man, the Plains Indians switched over to making their teepees out of heavy canvas, which is still used today. The basic pattern for the teepee covering is a half-circle with a couple of exceptions – both along the seam edge. These consist of a cutout for the door, with half of the door cut out from each side; and the flaps for the smoke hole, once again with one on each side. Canvas covers can be pulled into place if you have enough people to do it, but buffalo hide ones were much heavier. So, instead of pulling it into place, it was wrapped around a heavy pole and raised into place. Then, the covering could be unwrapped and pulled around the teepee to the joining side. It was always important to have the teepee joined together on the downwind side, as that was where the door was located. Where the teepee joined together it was connected with lacing pins. Think of holding a model of a teepee together with large sewing pins below the door and between the door and smoke hole. 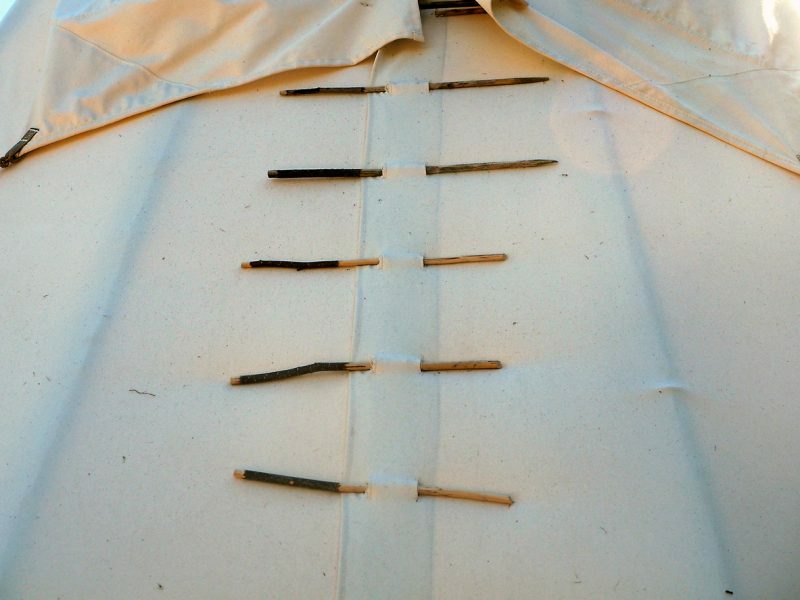 That’s essentially the idea, except that these pins would go through holes that were cut and bound into the covering – much like buttonholes. At this point, the position of the poles might have to be adjusted slightly. The covering needs to be taught so that the wind doesn’t make it flap and ruin it. Kicking the poles out slightly before putting in the tent stakes will help make it tight. 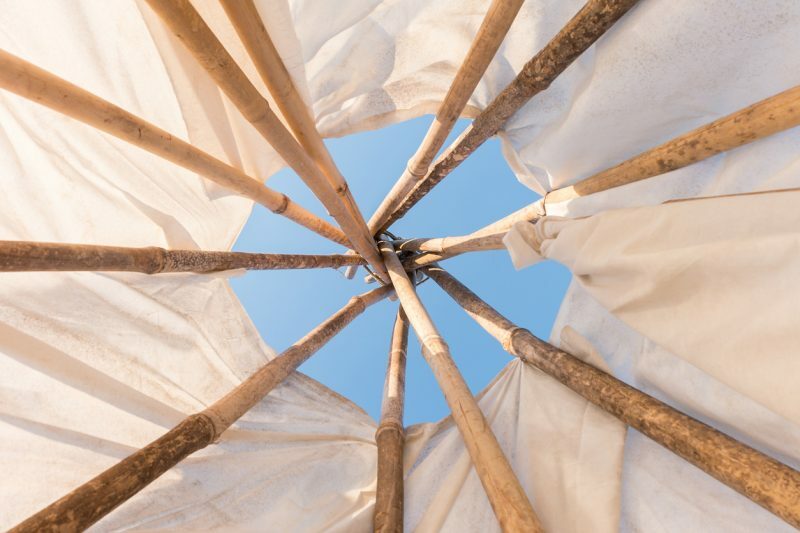 Finally, the two poles used for holding the smoke flaps were tied in place and adjusted to face the smoke flaps in such a way as to keep the wind from blowing into the teepee. These two poles were generally thinner but longer than the rest. 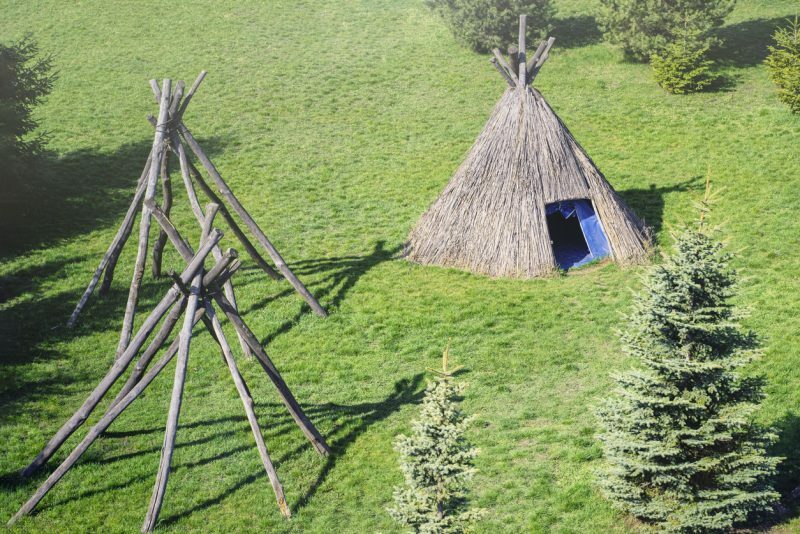 The floor of the teepee was covered with straw, hay, or long grass, usually with a layer of skins or furs over it. 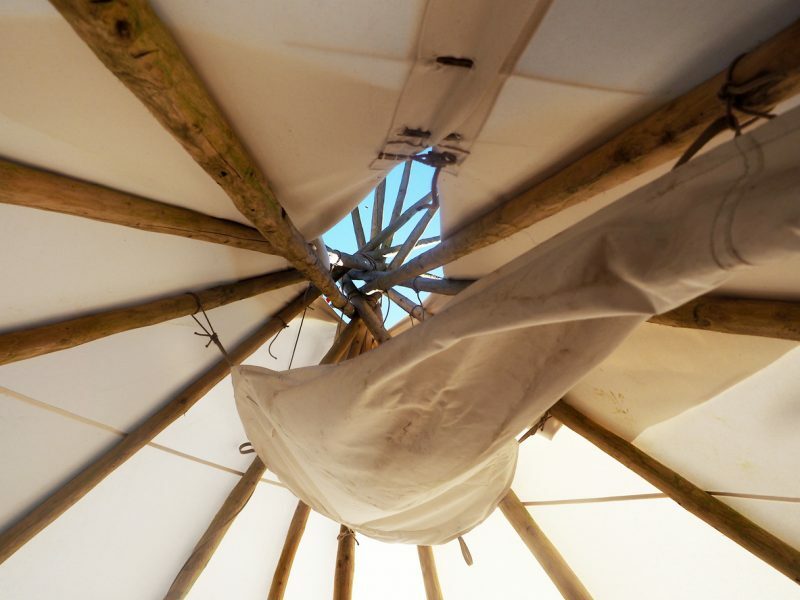 Compared to a modern tent, a teepee is a very inefficient structure – mostly due to the heavy tent poles. On the other hand, it is a sturdy structure that is not bothered much by the wind. 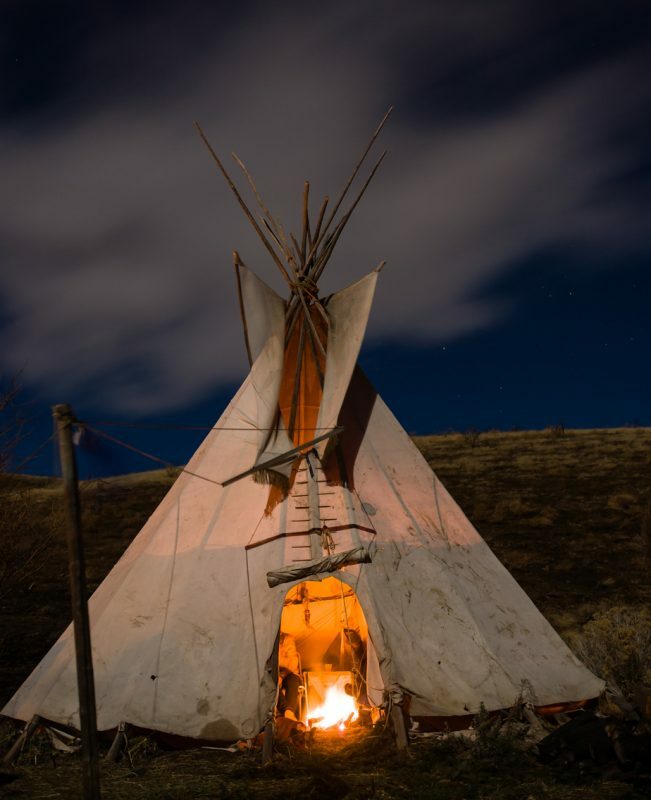 It is also possible to build a fire in a teepee, which can’t be done with most modern tents. I once knew a man in Colorado who lived a year in a tent, commuting every day into town to go to work. He had no problem, although he did say it was a bit chilly in the wintertime; but then, just about any survival shelter would be chilly in the wintertime. 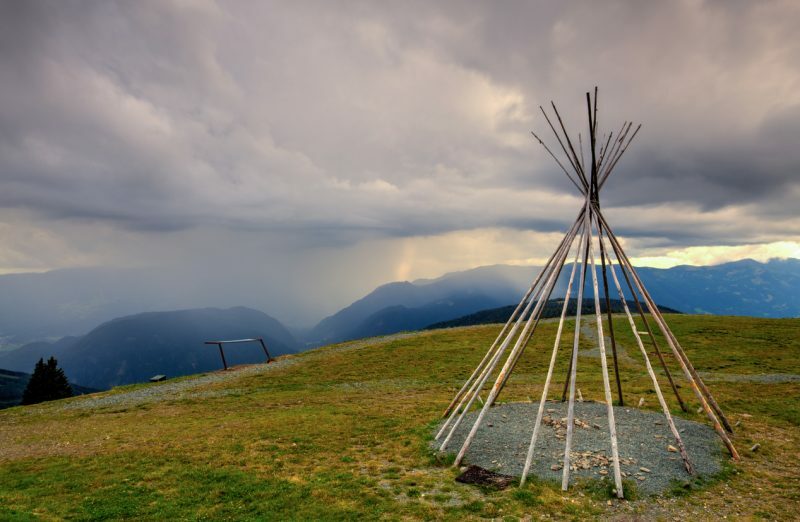 If you had a covering already made for the teepee but no poles, all you would have to do upon arriving at the place where you are going to set up your survival shelter would be to cut trees and peel the bark off to make the poles. This would make it fairly efficient in a bug out – assuming you could complete the bug out in your vehicle as there would be no other way you could carry the covering. 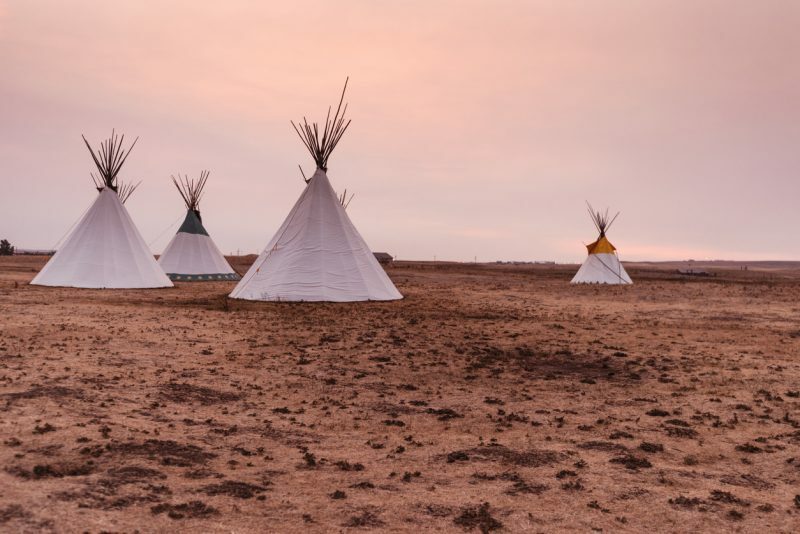 Compared to modern tents, which are usually made of ripstop nylon, the teepee would probably last well, especially in a hot climate. Ripstop nylon does great in cold and wet climates, but it can be damaged by too much heat and too much sun.